When I was working on Rogue Slasher with it's procedurally generated maps, I thought some of them looked like they'd make an interesting platformer map. The problem was that some spots would be very hard to reach with just a simple jump mechanic. How to expand on some of the basic platformer mechanics, in particular using the double-jump and wall-jump mechanic to get around the level. Originally, I had also wanted to include and in-air dash and a minimap but I just ran out of time, but something I'll probably implement in the future. Since I was using CSV data to create the map I had to add the coin objects a different way. 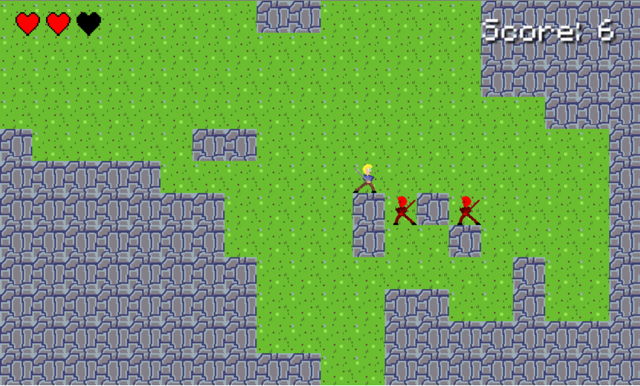 Using tile callback so I could interact with the "coins". When I tile was hit, I'd call the collectCoin function. Which would "pick it up" by setting the tile to be the same as the background tile and replotting the replaced tile using layer.dirty. As well, as playing the pickup sound and incrementing the picked-up coins counter.